How can you use TIME LAPSE in your classroom? Here is their presentation and projects seen at the conference. Enjoy! Finally! A sculpture project- WOO HOO! 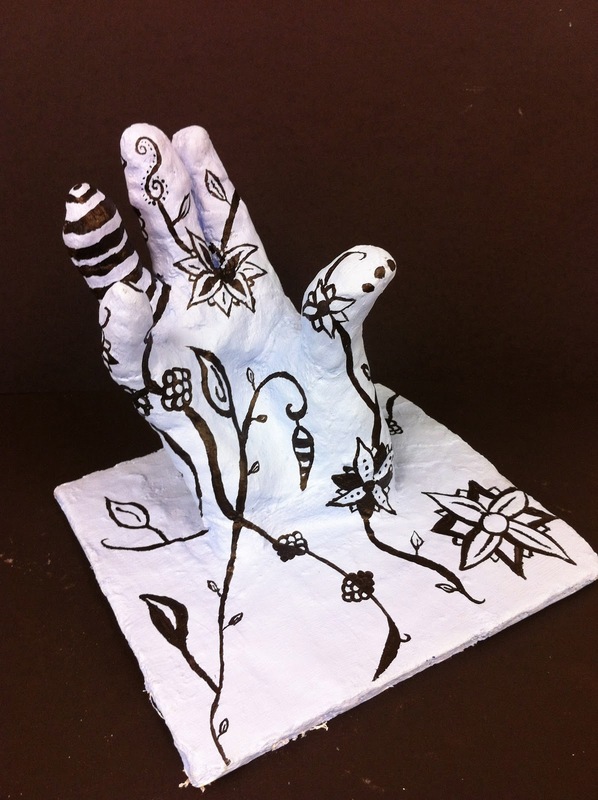 In this project, we looked at different types of sculpture techniques; created cast hands using plaster strips; attached the hands to cardboard bases using either plaster strips or papier mache; primed the sculptures white; looked at Henna traditions and other line drawings from different cultures; voted on a class color palette (white, black, and one color); planned our designs in our sketchbooks; painted our design on our hands! Phew! That's a lot- so let's break it down. 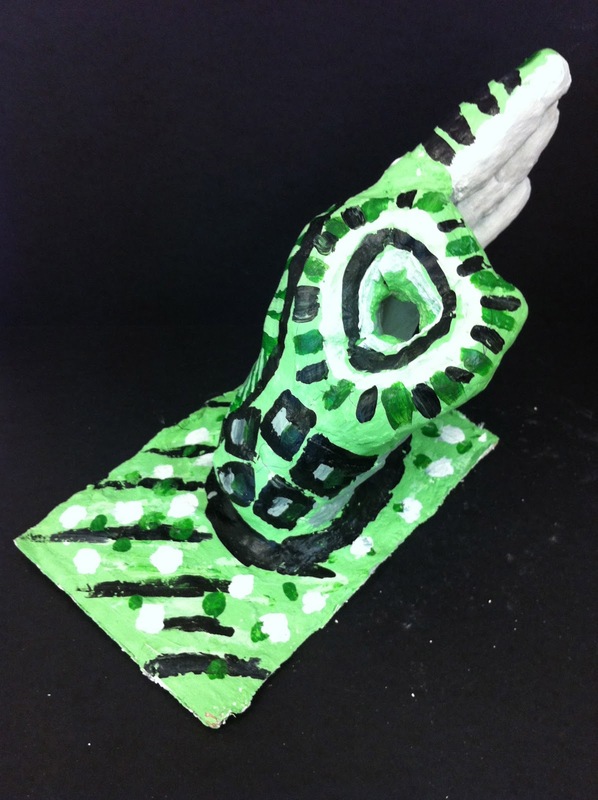 First and foremost, students were enlisted to prepare all of the supplies that they needed to make the sculptures. I had them cut up the larger plaster strips (plaster infused gauze) into smaller, easier to handle plaster strips about 1.5" x 6". "Who here has ever broken a bone?" My colleague Matt Milkowski and I started a "materials bin" and "materials manager" materials system at the beginning of the year in order to dish out and maintain materials per group. This system worked great! I was able to place a certain amount of supplies (for example: 2 pairs of scissors, 4 glue sticks, 1 set of color pencils) per group and then account for those materials at the end of each class. Once in the routine, students understood who was the materials manager that day and the responsibility that went with that role. However, as the year went on, the bins became more of my "specific materials bins" instead of student group supplies. Now one bin was designated the scissors bin, one was the color pencils bin, etc. This happened because projects started to become less structured by the material as they became more conceptual and open ended. For this project, however, I went back to the old system; each bin received a handful of plaster strips, one dry bowl (for water), and two pairs of scissors per group. In the past, one bin would serve a table of 6- this time, I needed enough bins for every 3 students. 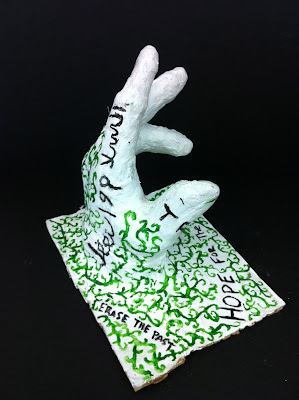 On what I would call the FIRST day of this project, I showed a Powerpoint of the sculpture process to the students. I had them take notes (as usual- Cornell!) in their sketchbooks. We took a look at what it means to CAST something, and we looked at all the different career fields that use the casting process. From the arts and entertainment, to geology and archeology, to dentistry and medical (prosthetics, etc), to engineering and manufacturing. I think the students were a little more interested in the powerpoint when I showed them how XBOX controllers are mass produced. Do students (or any of us, to be honest) really think about where things come from and how they are made? In the last 10-15 minutes of class, I had all the student come up to the demo table where I showed them MY hand that I cast for them to see. First impressions? "That's RAW Mrs. Taylor!" (In the beginning of the year, I had to ask what that meant... now I'm accustomed to that lingo- a "THANK YOU" is in order!) It's always a great feeling to see students get excited about what you are showing them, before they know that it is what they are doing. Now that I know it's "totally raw," I am happy to announce to them that... "This is what YOU will be doing!" Ok- a good start. While they are around the demo table, I explain to them the process in a nutshell- just a little appetizer before tomorrow's entree. "You will FIRST need to apply a release of vaseline to your hand. And why would we want to do that?" "Next, you will be dipping the plaster strips into the water buckets, "squeegeeing" off the excess water like this, then placing them onto your hands. Make sure to criss cross the strips, smoothing the plaster along the way. You'll need to work fast so that the plaster does not dry too fast. You'll also need to be very aware to reinforce and support your finger connections!!" On the second day, we begin. I don't say a word as the students walk in, but rather, I hand them this handout below and say over and over again, "Read this thoroughly before you start!!" These are the 3 main things to remember. Of course, it was written in my instructions. BUT! These tips were really reinforced while students were troubleshooting their own process. Ahhh, I LOVE this type of learning!! 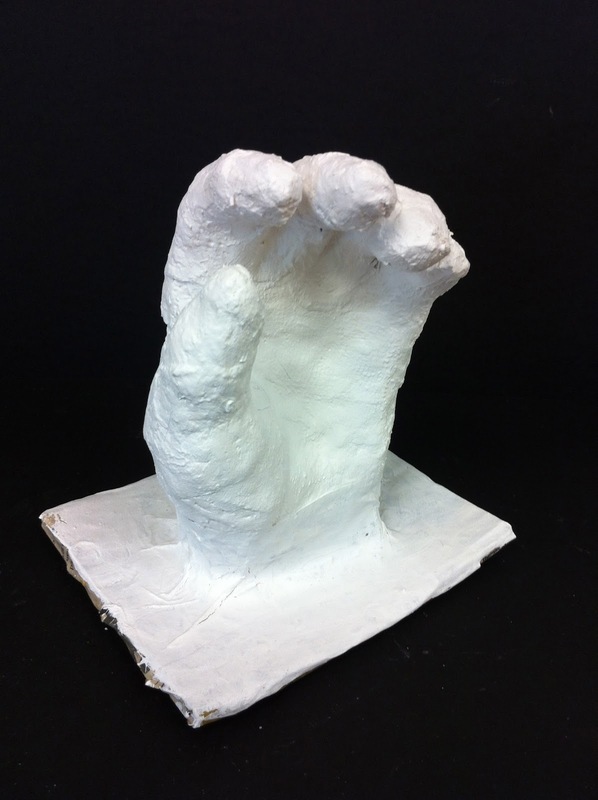 The hand casting process should take only 3 days since students were working in groups of three- one day per student in each group. Inevitably, there are students whose hands didn't turn out, whose hands needed small repairs, who didn't even make a hand. Ideally, on day five, we attached our hands to their cardboard base. 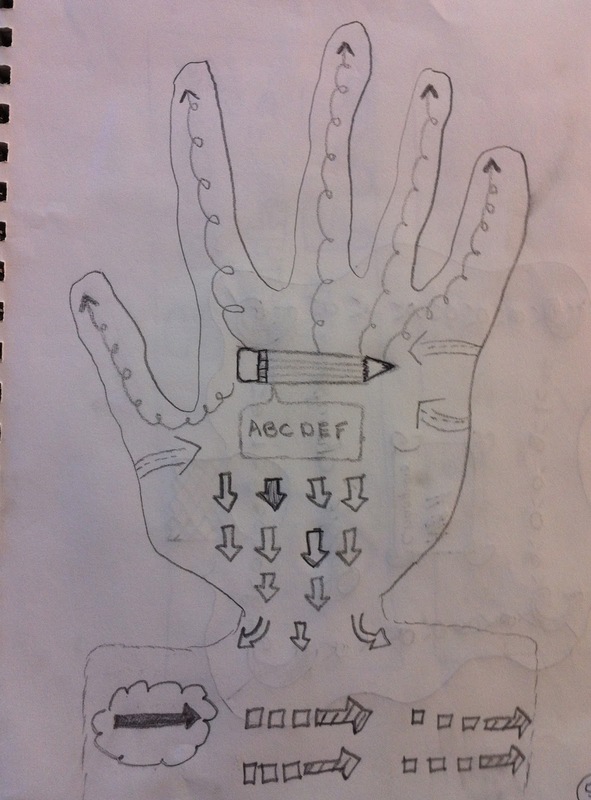 At this point there were some students working on this, some that were repairing their hands, some that chose to work on their Doodle 4 Google (our other ongoing homework project). 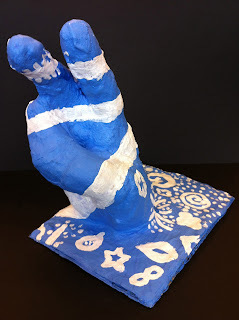 I cut up squares of cardboard and students used plaster strips to attach the hands to the cardboard. Students had to dampen the already hardened plaster in order for the NEW plaster to adhere to the hand. This process was short and easy. However! (Of course, there are always wrenches...) I RAN OUT OF PLASTER STRIPS!!! Yes, I did. Good thing I'm pretty flexible (most of the time), and had students start cutting up newspaper (MAJOR Kudos goes out to whoever stocks our stand with "The Mash" outside the main office- what a life saver!) to begin a papier mache process instead. While this wasn't as "clean" and more flimsy during the process, the papier mache worked just as well in the long run as the plaster strips in adhering the hands to their base. Students primed their hands and bases with thick, white acrylic paint. I was surprised by students telling each other that the white paint was glue- and they also seemed very confused by the term prime vs. paint (even though I had explained this). Anyway, before moving forward, I decided it was best to make sure all of my students were at this point- a fresh clean canvas. Ahhhh... how cool did it look to see all those white hands coming out of the tables! I wish I had gotten a photo of that. 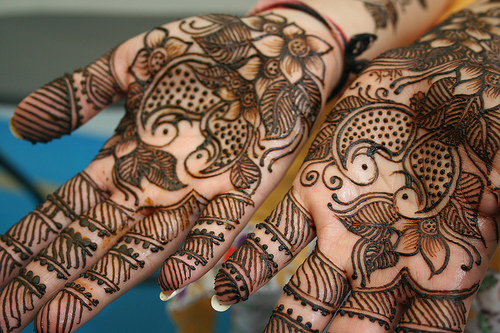 Today we took time to talk about and look at our inspiration for the design on the hands: HENNA. I showed a Powerpoint (and again, students wrote notes in their sketchbooks) on a nutshell history of Henna. We then looked at different line art used in various cultures (mehndi, celtic, islamic), and how we borrow these designs in the contemporary work we create today in graffiti and doodles. Students then used the remainder of the time to begin designing their hands in their sketchbooks. They used a variety of line weight, symbols, organic and geometric shapes/lines, to create a design that related to themselves. 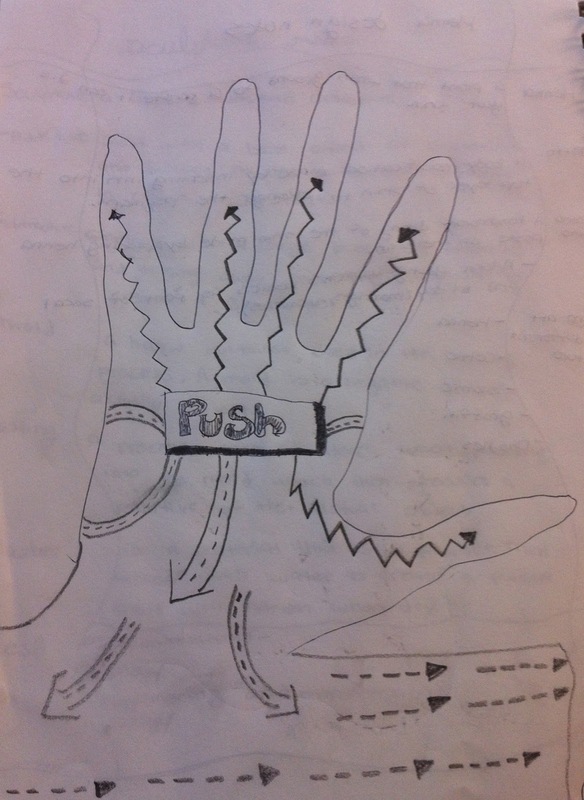 (A SLIGHT TANGENT) Something that I did not necessarily anticipate (although it was in the back of my mind to do this next year) was that some students remembered drawing the TEXTURE HANDS (a drawing project we made in the first quarter which had students change each finger into a different texture- a focus on the element of design TEXTURE. 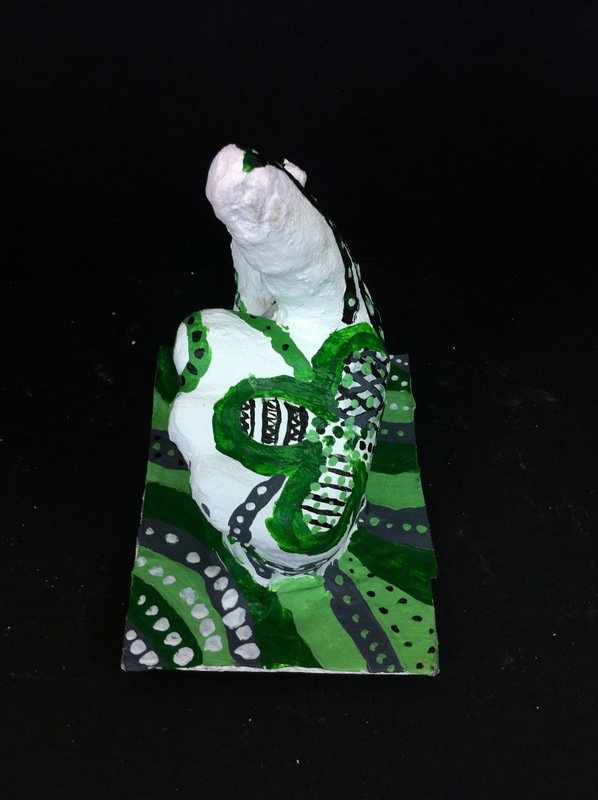 In that project, students looked at how to make that texture look three dimensional in a 2D drawing) and some students' designs looked a little like that project. I did think about combining these project next year and making this the texture unit project. Anyway, the students were REALLY engaged in this portion of the project! I was THRILLED to see what they came up with for the designs. I handed out packets of "Line Inspirations" of just henna type drawings, symbols, doodles, celtic and islamic inspired line art, etc. I'd say that out of 150 students that I taught this project to, only 3 tried to literally trace the images from the packet. 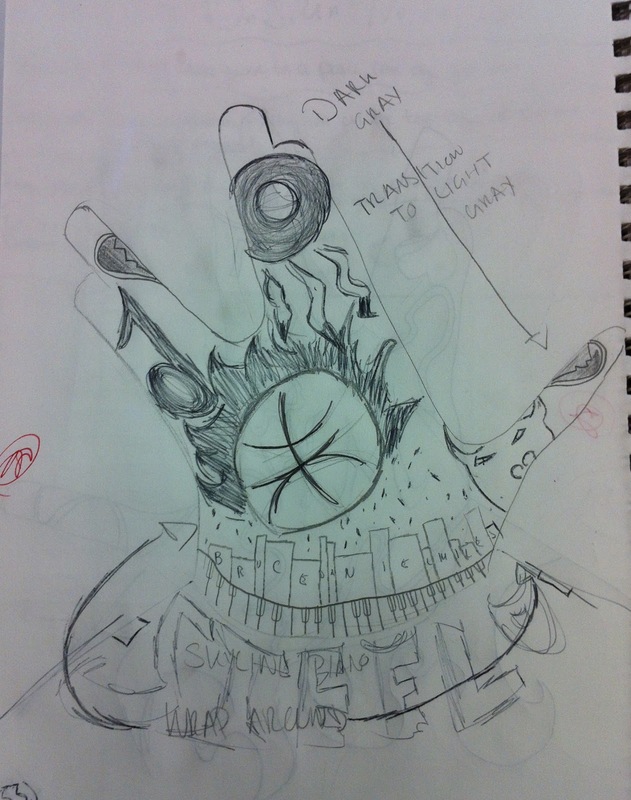 I was very impressed by the students' want to make their own original piece. On Day 8, (I know, misleading subtitle) I had the students vote on their color palette. Another colleague, Elizabeth Osborne, suggested that it would look really cool if all the students had one color palette- nice, clean, and a massive attack of hands! I liked this idea, so I made the students choose a palette per class: Black, White, and ONE color. Groan, groan, whine, groan. Okay- let me tell you how glad I was to have made this choice. 1. Students hadn't really done a color mixing lesson with me (we did a short color theory lesson on color schemes, but not physically mixing paint). 2. Too many colors for students who haven't had this lesson typically becomes a mess (both physically and visually). 3. Students had a large variety of choices- I just had to constantly remind them of all their color/shade combinations they could make. 4. I was able to really reinforce the idea of clean, graphic lines, and high contrast used in the henna style- which, after all, IS our inspiration for this project! 5. For a teacher who carries all the materials on a rolling cart, moving room to room, this really helped keep clean up and materials management down to a routine for me and the students. Phew! I can't even imagine what it would have been like having a myriad of acrylic paints for each class! Each period chose a different color ("Well, ok guys... period 3 already chose red... you don't REALLY want to be like them, do you?"). We had blue, red, green, and purple. Students could decide on any palette they wanted as long as they used contrast!! For example, a period 1 student had the freedom to paint their hand dark blue with white, light gray, and/or light blue line work. Or they could choose to paint their hand black with white linework. As a class, we talked about the various options students had. Soon, they realized the amount of freedom they truly had and the grumbles subsided. While students painted, I worked more individually to help them learn how to use the acrylic paint in this process- how to get sharp lines, how to clean it up, how to make the lines skinny, how to keep the flow over a bumpy surface. I have to admit, after the first day of painting I thought, "Oh boy. 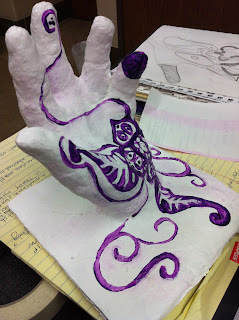 Maybe this was not the best choice (the henna inspiration) for this project (hand sculpture)." After the second day, I was so blown away by how well my students took to this project! I was very impressed by how well the students did across the board. Here are some examples! I would LOVE to have a large installation of all of the hands together but we don't really have a secure location for this type of show. I will definitely be holding on to many of these for our Kenwood Art Show in May- and maybe even some for next year's All City Art Show. Enjoy!